I started fostering for Cats Protection in August 2013. I had always thought of myself as a dog person and I wasn't overly fussed by cats! I found them stand-offish and aloof, not loving and friendly like dogs. Then in 2010, a ginger kitten moved himself into our house and my love affair with cats began! This tiny, eight-week-old bundle of fluff strutted into our front room, swiped the dog across the face and promptly claimed ownership of the dog’s chair! The dog duly noted her new place in the household hierarchy, below the cat! In 2013, our neighbour moved and needed to rehome her four-month-old kitten. Fizz moved in with us and we became a two cat household. The dog downgraded herself again in the pecking order! 2013 was a funny year for me. It was approaching the 10 year anniversary of my mum’s death and the children were in full time education. I felt the need to do something to mark this big anniversary, so I decided to have a year of saying ‘yes’ (within reason!). I signed up to sell daffodils for Marie Curie (I still do this every year, and have now roped my sister-in-law in to do it as well! ), I completed my first Race For Life, and I volunteered to foster for Cats Protection. Fostering was not a decision we took lightly as a family. I followed the hard work of our local Cats Protection ladies on Facebook, then I saw the appeal for fosterers. It was something I wanted to do, but I knew it was something that would impact on the whole family. I had two boys aged six and four at the time, as well as my husband to consider. But my wonderful husband knew about my year of ‘yes’ and he saw that it was something that I wanted to do, and he agreed to let me use our spare bedroom as a cat B&B! Once we knew it was something that we really wanted to do, we had a home visit from fellow branch fosterer Val, who talked us through everything and checked our suitability as fosterers. Thankfully she thought our rather household would be a good fostering environment. At this point, we had to sit the boys down and let them know what we were up to! We told them that we wanted to look after cats that didn't have a home of their own, but that the cats would only be staying with us for a holiday until they found a forever home of their own. Thankfully the boys thought that this was a brilliant idea, and they couldn't wait for our first foster cat to arrive. Since we started fostering, we have had a wide range of different cats, each one lovely in their own way. Much as I miss the foster cats when they move to their forever home, it is such a great feeling to see a down-trodden or forgotten cat go to new owners who will love and spoil them in the way that they deserve. We have had an epileptic cat, cats that have just appeared in people’s gardens, cats that people have got from Gumtree and many kittens. The more memorable ones are Dash, who was found tied in a carrier bag ready to be thrown into the lake, Casper and The Wombles. Casper was a beautiful, but depressed, long-haired stray who came to me after moving into someone’s back garden. He was only with us for a few weeks when I took him to a homing show. A couple came to the show to donate, but not adopt, as they had only recently lost their cats and weren't ready for another. She asked for a cuddle with Casper, but was adamant that she didn't want to adopt. He wouldn't let her go! He reached out for her when she passed him to her husband and they committed to adopting him there and then! He is now a thoroughly loved and spoilt cat who has found an amazing home. The Wombles were four kittens found in a box in the park. They were handed into the PDSA and then passed onto us to foster. This was at the beginning of the summer holidays. The kittens were approximately three weeks old and needed hand feeding. We had four hungry kittens totally dependent on us! The boys came into their own at this point! They got stuck in with hand rearing these kittens, syringing feeding them kitten milk, playing with them and giving them unlimited love and affection. My children learnt so much that summer, it was an experience that they were very privileged to have and it taught them so many qualities that will be useful in life. It taught them kindness, compassion and patience, but best of all, it kept them occupied for the whole six week holidays! Our circumstances have changed slightly and we now need to use our bedroom for humans. So we have a cat pen instead! It is attached to the side of the house, and has its own heater and outdoor run. It means we can still have foster cats when we are on holiday, as people can access the pen to look after the cats for us. Although I am mainly a fosterer, I do get involved with other aspects of Cats Protection’s work as well. I have helped a little with collaring cats that may be strays, including the infamous KFC kitty who lived in their car park eating as much chicken as she could fit in her tummy, and have participated in a chip and snip event, where over 80 cats were booked in for neutering in four hours! 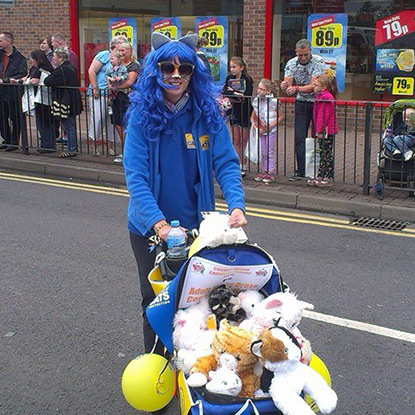 I also joined the Cats Protection ladies in the carnival last year and had one of the most fun days I've ever had! I laughed and danced my way around the town in a blue wig and cat ears! I have made so many good friends at Cats Protection and have met so many wonderful people in the course of my volunteering. Interacting with the public when you are wearing your blue army uniform is brilliant. You meet so many people enthusiastic about cats and supporting you in the work that you do. I can honestly say that I am so pleased that I had a year of ‘yes’. It took me considerably outside of my comfort zone but it also changed my life in a positive way. There are no words to describe the satisfaction of watching a cat that you have nurtured and loved leave to join their new family. If you think you could make a difference and volunteer for Cats Protection, search for a volunteering opportunity in your local area. Old cats need love too!